Massively pleased to have made Troubled Diva's round-up of 2003 for some of my Dr Who comments (see September 27th) but it seems I may have to eat my words about Colin Baker. (Eagle-eyed readers will note that I have already eaten my words, unprompted, about Dido - described early on this year by k-punk as the very personification of blandness or somesuch - Girls Aloud and, to some extent, David Sylvian solo, so it's nothing new.) Both the estimable Angus and Tom Ewing have surprised themselves by really liking Vengeance in Varos, a Colin Baker adventure. My goodness: is a transvaluation in progress? Annoyingly, UK Gold has taken Dr Who off its late, late night Fridays and Saturday omnibus slot and buried it in more bite-size pieces earlier on in the evening throughout the week, so chances are I won't have the opportunity to catch any of the C.Baker episodes to see if this astonishing re-evaluation is merited. (At least I managed to re-view almost the whole of the Pertwee and the Tom Baker episodes before this re-scheduling travesty. Bliss!) Hmmmmm. Remind me I owe you posts on irony and awe, Children of the Stones and Sapphire and Steel, will you? Revelation of the Daleks is still a cracker as well if memory serves (jesus, it's nearly 20 years since i saw it) - if only coz the black comedy that was Saward's real love (as much as it was hard sci-fi for his predecessor Bidmead) really comes thru on this. Most of the rest of Baker's stuff was rubbish - but that was due to poor scripts rather than CB. I rate some of Davidson's stories highly (castrovalva, snakedance, mawdryn undead). Can't seriously see the rehabilitation of the second Baker though (but I've not got cable so this is all from memory). Mark made this comment earlier but it bears reiterating: the real signs of impending doom in the davidson-baker era were the costumes, ridiculous costume-dept. attempts at creating a pan-galactic eccentric english gent. Unlike Tom Baker and his predecessors, who had an aura of authenticity - their costumes had an deshabille aura of having been assembled haphazardly from hasty offhand purchases at gallifreyan charity shops over a period of decades, and well-seasoned over years of timetravelling. Genuine down-on-luck hobo-gent threads. By contrast the later costumes, rather than being a credible product of long-term eccentricity, were logic-defying over-designed 'zany' thesp-wear. What happened? The classic BBC decline into self-satisfied irony, of course - they stopped thinking seriously, realistically about the doctor as a character, and started thinking about him/the show over-consciously as a venerable 'institution', as a set of cliched identifiable traits to "celebrate" (with a smattering of smug self-parody of course). During the last three doctors the show wavered between its original impulse which, even if the results were sometimes risible, was a serious impulse to make the best of a good idea and a small budget, and this parasitical mode that because of a basic lack of respect and attention eventually got the upper hand and destroyed it (the cretinous sylvester). 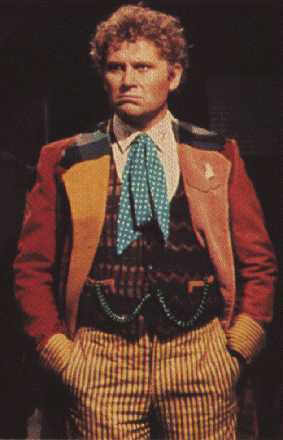 Having seen "The Two Doctors" on DVD (first time I'd seen it since 1986; I remembered almost nothing of it), my suspicion that Colin Baker has been critically hard done by has been increased. I still think he was lumbered with some kind of ho-hum stories, but he himself in the title role did some not bad work.